Two remixes with different playing speeds! 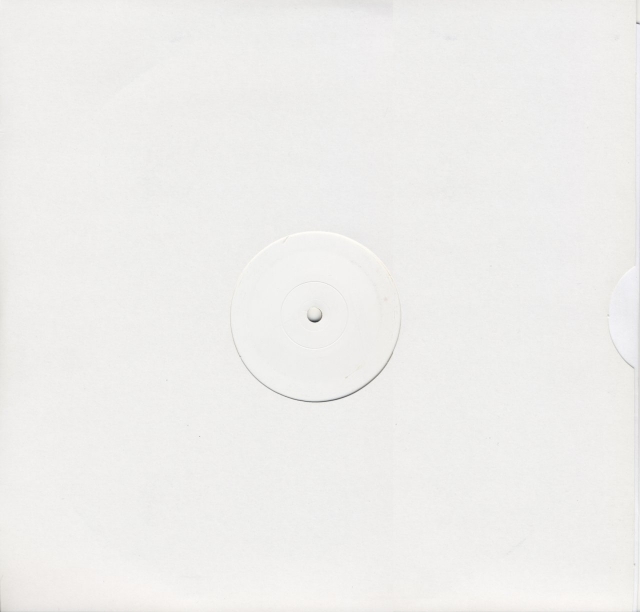 White label vinyl record with neutral white cover. The tracks are much longer than the ones that ended up on the So Sweet promo CD single. Also Dfl-00-3 added on both sides. On the A-side, the T in SWEET has been started out as a J. 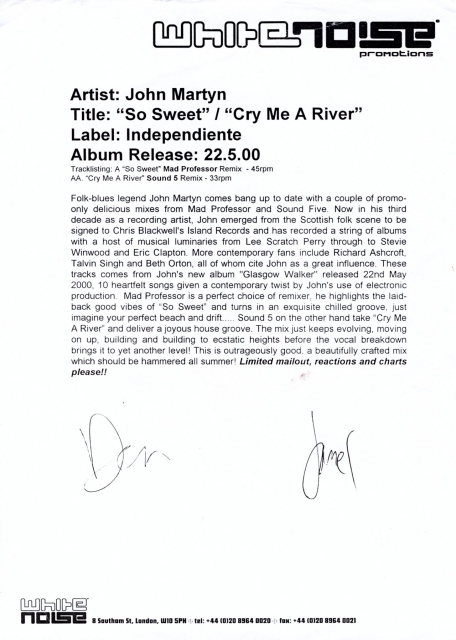 Title: "So Sweet" | "Cry Me A River"
Folk-blues legend John Martyn comes bang up to date with a couple of promo-only delicious mixes from Mad Professor and Sound Five. Now in his third decade as a recording artist, John emerged from the Scottish folk scene to be signed to Chris Blackwell's Island Records and has recorded a string of albums with a host of musical luminaries from Lee Scratch Perry through to Stevie Winwood and Eric Clapton. More contemporary fans include Richard Ashcroft, Talvin Singh and Beth Orton, all of whom cite John as a great influence. These tracks come from John's new album "Glasgow Walker" released 22nd May 2000, 10 heartfelt songs given a contemporary twist by John's use of electronic production. Mad Professor is a perfect choice of remixer, he highlights the laidback good vibes of "So Sweet" and turns in an exquisite chilled groove, just imagine your perfect beach and drift... Sound 5 on the other hand take "Cry Me A River" and deliver a joyous house groove. The mix just keeps evolving, moving on up, building and building to ecstatic heights before the vocal breakdown brings it to yet another level! This is outrageously good, a beautifully crafted mix which should be hammered all summer! Limited mailout, reactions and charts please!! 01 So Sweet (Mad Professor Remix) - 45rpm [5:09] Reggae approach mixed by dubmaster Neil Fraser. 02 Cry Me A River (Sound 5 Remix) - 33rpm [9:00] Awkward dance mix. John's voice comes in after 3,5 minutes.